Considering I was nine at the time, this blew my effing MIND. 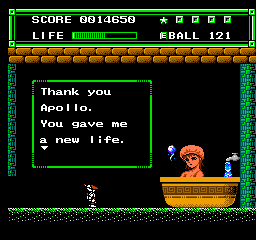 For some odd reason, this game is as dear to me just as Blaster Master. Maybe it's because of the similarities between the two where there are two types of gameplay present (Blaster Master's top-down levels and side-scrolling "map"). Maybe it's because the music stuck with me all these years. Or maybe it's just that chick in the bath. I was a nine year old boy, so that may very well have been it. Regardless, I did beat the crap out of that game and would probably do the same thing today if it was available. 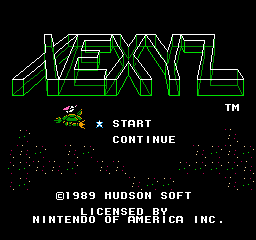 Sadly, there isn't a Virtual Console version of it out, but even though Nintendo seems bound and determined to NOT support the VC I still hold a re-release of Xexyz in the realm of possibility. The game's made by Hudson Soft and, as they are one of the few third party companies still supporting the Wii with everything they got, they put a lot of their older titles on for download or even remake them for WiiWare or disc. I'm probably viewing the game through some heavily tinted rose colored shades here but I'd definitely throw five bucks at this or even more at a proper remake. Knock on wood.